The following people born in the villages around Ripon were recorded on the various census as inmates in the Union Workhouses in the area. ASCOUGH ELIZABETH. u/m age 35. Charwoman. Imbecile. Born Azerley. BARKER JOHN. u/m age 59. Gen Labourer. Born Healey. BODDY FRANCES. u/m age 35 Charwoman. Imbecile Born Sawley. FAIRBURN JOSEPH. u/m age 73. Ag Lab. Imbecile from birth. Born Kirkby Malzeard. KNAGGS ROBERT. Widr. age 33. Bricklayers Lab. Born Azerley. LOFTHOUSE ANN. u/m age 50. Imbecile. Born Grewelthorpe. THIRKILL GEORGE. u/m age 69. Woodcutter. Born Sawley. WATSON ELIZABETH. u/m age 45. Dom. Serv. Born Kirkby Malzeard. CHAPMAN JOHN. unmarried age 59. Butcher born Sawley. DAWES MARY ANN. u/m aged 64. Imbecile. Born Kirkby Malzeard. JANSON JANE ANN. u/m aged 27. Deaf & Dumb. Born Kirkby Malzeard. LOFTHOUSE ANN. u/m aged 60. Former Dom serv. Imbecile. Born Kirkby Malzeard. MURRAY ALICE. child age 2. Born Mickley. SMITH JAMES. u/m aged 66. Blacksmith. Born Grantley. WADDINGTON JOHN. u/m aged 65. Gen. Lab. Born Galphay. WOOD THOMAS. u/m aged 59. Ag. Lab. Born Dallowgill. In 1888 it was reported in the Leeds Mercury that the Master & Matron of the Ripon Union Workhouse were Mr & Mrs Greenwood. They were celebrating their sliver wedding and were presented with several fine gifts from the Board of Guardians. BILTON JOSEPH. Widr. age 79 Lab. Born Kirkby Malzeard. HEATH WILLIAM. Widr. age 86. Tailor. Born Mickley. HORNER JOHN. u/m age 73 Lab. Idiot. Born Sawley. JACKSON ISABELLA. u/m age 56. Idiot. Born Grewelthorpe. JANSON JANE ANN. u/m age 36. deaf & dumb. Idiot. Born Kirkby Malzeard. LOFTHOUSE ANN. u/m age 69. Dom Serv. Idiot. Born Kirkby Malzeard. WATSON ISABELLA. u/m age 19. Idiot. Born Kirkby Malzeard. HOLMES THOMAS. Born 1800. Died 1883 aged 83. from Kirkby Malzeard. Workhouse adjoining Knaresborough Grammar School. CRABTREE SARAH. age 1 born Mickley. Also her Mother Ann and sister Maria. SCRUTON ELIZABETH. Married age 70 born Ripon. KERTON GEORGE. married aged 65. Former Gen. Lab. Born Kirkby Malzeard. Tenders for supply of the workhouse for the ensuing half year which were accepted. Lofthouse & Hammond. Boroughbridge. Flour. Sturdy & Son Knaresborough. Joiner work. James Foster Forest Lane Head. Mason. Groves & Co. Knaresborough. Beers & Spirits. Map showing site of Bedale Workhouse. 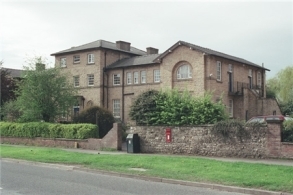 Bedale Workhouse. Built in 1839. Report from York Herald March 1900. GALLOWAY JOHN. u/m aged 47. Imbecile. Born Masham. NORRIS ANN. u/m aged 75. Imbecile. Born Masham. PEACOCK John. pauper u/m 66 farmer born Kirby Malzeard. FAWCETT Mary. pauper/ u/m 21 serv. born Masham. FAWCETT Margaret. pauper 1 mth born Leyburn. WILSON Jane. age 46 inmate born Kirkby Malzeard. ASCOUGH Jane. U/M age 44 Imbecile born Masham. There was a Poor House in Kirkby. The overseer of the Poor House in Kirkby explained that in 1832 it incorporated the four adjoining townships of Laverton, Azerley, Grewelthorpe and Kirkby Malzeard. These were all within 2 miles of each other. Kirkby had been, in 1832, established for 12 years. (See Appendix to the First Report from the Royal Commission on the Poor Laws of 1832. p. 769a.) Until 1834 Overseers were appointed to carry out the,Relief of the Poor&. Awkward paupers were threatened with the workhouse in Ripon. 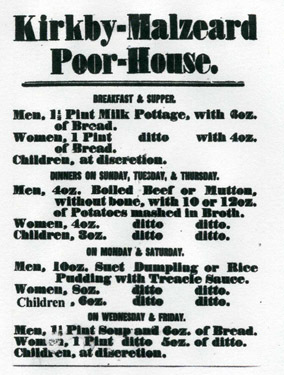 In 1852 the Poor House was not big enough. Kirkby was replaced by The Ripon Union formed in 1852 (October 6th.) Kirkby Malzeard was one of the 32 townships in the Union . By 1873 12 more had been included. More details available from the Workhouse Museum in Ripon. The Poor House, in Kirkby as it was commonly called, stood on Main Street near the Queen’,s Head and on the same side of the road. If you stand at the Queen’,s Head and look West towards the West End and Ringbeck, the Poor House was the first house you can see after the end of the land belonging to the pub. Thanks to Ian Corfield of Kirkby Malzeard for the above information. THWAITES THOMAS. aged 64. Former Farm Lab. Born Healey. METCALFE Esther. u/m age 51 born Fearby &#8211, feeble minded. SAYLE Robert. M age 76 born Fearby. METCALFE Esther. u/m age 61 formerly gen dom serv. born Fearby. AKENS JANE. widow age 82. Pauper born in Ripon.